This page takes a granular look at what is in the water that we provide to you. Baton Rouge is fortunate to have water that is pure and clean. Many water supplies require extensive treatment to the raw water before it is fit to drink. The water we use has been naturally purified and filtered through the earth's rock and sand formations. 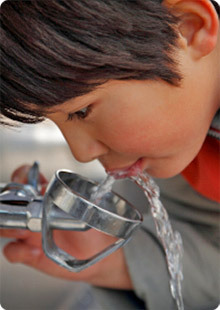 Chlorination of the water in the ratio of 1.4 parts per million assures that our water remains pure and safe to drink. Click on your water provider to see the annual water quality report. Q. Why would my water smell like rotten eggs? A. The naturally occurring raw water in the Baton Rouge area has a sulphur smell. Before the water leaves our pumping stations, it is chlorinated which removes the smell. If you have been away on vacation or your water has not been used for several days you may notice that this smell has returned to your water. This is because the chlorine dissipates in the water over time. Water heaters in the home commonly cause this to happen more rapidly because the heated water dissipates the chlorine at a faster rate than in the cold water. If you notice the smell, try to determine if it is in your hot or cold water. To do this: take a clean glass, take a sample of the cold water, and step away from the sink, (sometime the sink will create smells from the drain). If you notice the smell let your cold water run for 2-3 minutes to bring fresh water in to your home. If this does not take care of the problem then call customer service. Q. Why would my water have a brown tint? A. The water in our area has a small amount of a naturally occurring mineral called manganese. Over a period of time it settles out in the distribution system. Events in the distribution system such as fires, construction and main line breaks can create a rapid movement of water. This can cause the sediment in the water main to stir up. After this happens you may notice that your water has a darker than normal tint. To resolve this problem run your cold water for 2-3 minutes. If you notice this problem in your toilets or hot water heaters remember that they have tanks that need to be cleared after your incoming cold water runs clear. If this doesn’t clear the problem then please call us so we can address the issue as quickly as possible. Please do not hesitate to notify us of these types of problems. We rely on you to tell us when there is a problem.